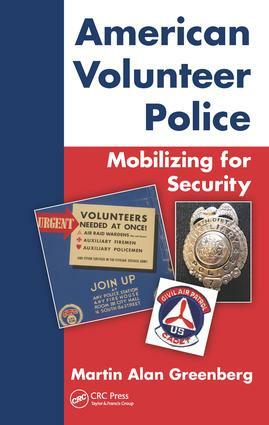 Overview of Volunteer Policing. Introduction. Mobilizing for Security. The Early History of Volunteer Police. Auxiliaries and Reserves: Volunteer Police Generalists. Volunteer State Police. The Federal Government and Volunteer Policing. Special Issues in Volunteer Policing. Non-Sworn Roles of Adults in Volunteer Policing. Youth Involvement in Police Work. Youth Involvement in Public Safety and Security at the Federal Level. Legal Issues and Volunteer Police. Volunteer Police and the Prevention of Human Trafficking. The Future of Volunteer Police. Epilogue. Appendices. Appendix A: The Commission on Accreditation for Law Enforcement Agencies Reserve and Auxiliary Police Standards. Appendix B: Modern Era National Service Time Line. Appendix C: Preventing Terrorist Attacks. Appendix D: Selected Government Internship Opportunities with Federal Government Intelligence Agencies and Law Enforcement Agencies. Appendix E: Human Trafficking�A Brief Annotated Bibliography. Index.